The American Philatelic Association (APA), now the American Philatelic Society (APS), was founded in 1886. The APS is celebrating its 125th anniversary this year and a brief history of APS is located on its website. In the beginning the “Library Department” for the APA was housed in the home of the APA member who was designated as the librarian. The first librarian, E. D. Kline of Toledo, Ohio, posted a notice in the first issue of The American Philatelist soliciting donations to the library. 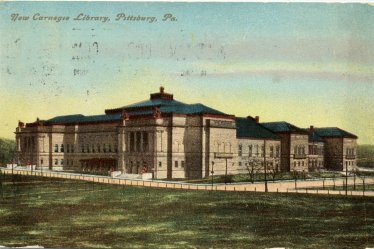 In 1895 the City of Pittsburgh, PA opened a magnificent new library courtesy of Andrew Carnegie which was named appropriately the Carnegie Library of Pittsburgh. In 1897 the APA board voted to place the Association’s library in the new library building in Pittsburgh where it was administered by the Pittsburgh library. A good idea in the beginning gradually diminished in effectiveness and in 1928 the board of APS voted to relinquish any claim to the philatelic library in the Carnegie Library of Pittsburgh. It would be another forty years before APS would have a library of its own. In 1901 the publication Books on Philately in the Carnegie Library of Pittsburgh was published. It is my understanding that much of this early philatelic library collection still exists at the Carnegie Library of Pittsburgh. Thanks for this post. I went to library school at the University of Pittsburgh, just a couple blocks from the Carnegie Library of Pittsburgh. The Carnegie Library of Pittsburgh’s Rare Books Collections includes a philatelic literature collection, although the description says it originated as the Carnegie Museum of Natural History’s stamp library. I was in Pittsburgh over the weekend and stopped by the Carnegie Library of Pittsburgh. I can verify that at least some of the books are still there, with bookplates indicating they came from the APS.